Mix Miller, writer/artist of the (quite excellent) webcomic Shattered With Curve of Horn (which y’all should read!) has just embarked on an interview series, 9 Questions, 9 Answers, and he asked me to be the first participant. It has some insight into my process, interests and comics, and also my opinions of comics, interests and process. Give it a read if that sort of stuff interests you! I finally managed to get all of the print issues moved to my new place (I’m in San Diego now! ), so I can start offering them for sale via our new store! So far, we’ve got Issue 1 and Issue 2 of Alpha Flag for sale, the Charlie pin, and a very limited number of SF minicomics that were previously only available at convention appearances. All profits will go toward printing Issue 3 in the near future, new products (I’m getting a bead on Victor pins and silkscreen prints) and convention appearances. As a bonus for big spenders, anyone who spends $15 (before shipping) in the store will get a little sketch by either Renee or me (or both?!) slipped into their outgoing package. All orders will get a free Alpha Flag bookmark, though! We can ship anywhere, and unfortunately it’ll cost a little more to ship outside of the US. So Alpha Flag has been on unannounced hiatus for the past couple of months. I’ve been taking some much-needed time to catch up with the mounting stack of paid work that I was accruing. I wasn’t really happy to have to put Alpha Flag on the backburner for the time being, but paying the bills has to come before passion projects. Now that I’m in a better position with those, I can do some more Alpha Flag! Today I’ve posted Foxtrot 03, continuing right were we left off. If you want to check out some of the work I did while we were out (and I think you should! ), you can check out www.tommycentro.com. It’s a multi-genre-spanning, chiefly superhero comic about an ensemble cast figuring out a murder mystery. It’s written by Jakob Free and drawn by me, with some of the designs by Ryan Jampole. I’ll update you on the other projects when/if I can. In the mean time, check out the new page, and expect more in the coming months. I just put up Foxtrot 02, but that’ll be all Renee and I can get out until we return in 2013. See you then, and thanks for reading! Renee and I are going to be at Bent-Con for the weekend. Today, through Sunday! We have a table, but we haven’t been told what number it is yet! It’s an LGBT/queer-focused comics (and all the associated media!) convention. More info at the Bent-Con website. It’s only the third year they’ve been putting it on, and neither of us has been, so we can’t tell you what to expect if you go. We hope to see you if you are going, though! 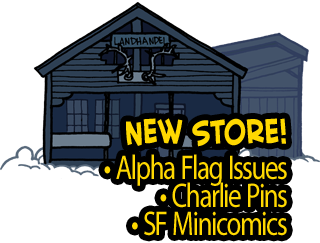 We’ll be selling Alpha Flag issues 1 and 2, Charlie pins, and issues of the Untitled SF minicomic.